Every Friday night we bundle up the kids and head over to Husbands parents home for a big, fat, Lebonese, family dinner. There are 25 of us these days, before anyone else decides to drop by. Which they do. With so many to feed, and so many babies floating around, seating and eating time comes at a premium with first in, best dressed, and everyone else stuck looking after toddlers and babies until a seat becomes available. We sit on couches, mismatched dining chairs, odd coffee tables lying around, whereever we can really. The big kids can be found clustered on chairs and arms, usually playing some ridiculous game while they absent mindedly eat their food. Toddlers are usually gathered together on mini chairs round a coffee table, or more likely on laps as we try to wrangle them into eating. We have a little odd one out. Niece age 4. Too little for the big kids, too big for the little kids (who unfortunately walk all over her). She's the most awkward, and it was her I had in mind when I got the opportunity to do a review for Toosh Coosh. I picked up my Toosh Coosh from the SPBCE a few months back. It was one of the few things on my list to buy that day. We don't want to buy another high chair for Sebastian (now 11 months), but Lorelei is still too little to be sitting comfortably at the table with us, and we like to eat together as a family. So Toosh Coosh, with it's soft rubbery-like seat, seemed like a great idea to bridge the gap between high chair and dining table seating. Even though she is a little younger than the target demographic (3-8) Lorelei loves being that little bit higher at the dinner table - it means that she doesn't have to sit on her knee's to get the height she needs and unlike a plastic seat we have bought before, Toosh Coosh stays in place on the chair and doesn't slide around. I took my Toosh Coosh along to a Friday night family dinner to road test it with Miss 4 year old niece, just to see how it fares with the target age. The booster was perfect for her, giving her height and comfort and earning a big, toothy, grin of approval. Funnily enough, all our toddlers had to give the Toosh Coosh a whirl as well once they saw their older cousin sitting in it, and it was being dragged from one end of the place to the other all night. I see even more potential for our Toosh Coosh - it's light, so I can see us taking it along to restaurants where you often can't fit more than one high chair at the table. Also to the movies where the hard plastic boosters provided just aren't designed to keep little bottoms comfortable for 90 minutes plus previews. Toosh Coosh retails at $49.95 (or you can bag a sibling pack for only $90) and comes with a free copy of Jo's ebook - Mealtimes Without Mayhem - for those of you, like me, that enjoy getting your family together for a meal. And because whenever I find a product that I just love I have organise one for my readers to win too! Thanks to Jo Turner at Toosh Coosh, I have one to give away to my readers. Easy entry via raffle copter below, and I'd specially love it if you would drop by Jo's facebook page to say hello! If you want to catch more of my adorable niece, she can be found over at my SIL Salz blog. No more fighting with the youngest trying to get him in and out of a high chair, he will finally feel like a big boy! Oh I have a tall three year old that this would be the perfect solution for! She would LOVE this!! No more chasing after my son during meal time. We have a high chair but the thighs part is too tight and he doesn't like the chair. My niece would love to be part of the family, making her feel grown up. What a great idea :)) My Aunty status would also go up a notch. It would save us playing musical highchair with our 2 year old toddler and 6 month old baby at meal times, currently I feed the baby first and then whip her out of the chair, so that the toddler can eat his meal as well! Wow! This would mean I can finally eat like a normal person without having a little human being on my lap. Toosh Coosh seat will be enough to motivate my son to sit at one place on the dinning table chair and finish his meal rather than eating while jumping around and throwing food on the floor. We have enough boosters for our kids but we need one for our little grandson (who is the same age as his aunty ;) ) It would be so handy at mealtimes when he is around! It's nice to have the little people sitting with the adults and sharing meals all together. This would be great for our toddler, a bit safer then her just sitting on a dining chair which she insists on doing now. Would be handy for the "tidier" meals and snacks, rather then going through the highchair wrestle just for a snack. It would encourage my child to independently sit in their chair, be able to use their cutlery and eat politely as they can reach the table! A neat little invention that can be carried and used every where. 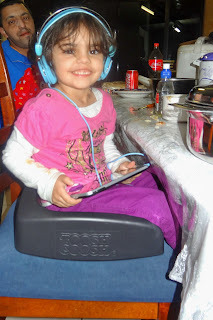 My little miss almost 3 is quite independent and decided almost 12 months ago that a hugh chair was assistance that she didnt need. The 500m wide spill zone left after each meal would prove otherwise but she will not be swayed. The toosh coosh looks like just the thing to boost her up high enough that she might be able to see what she is trying to precariously move from her shaking spoon to her constantly chattering mouth. Would the toosh coosh help at all with the constant chattering too because that would be truly awesome. This would allow my youngest son to reach the dinner table without having to sit on his knees. This would not only help him but look fantastic while doing it! My daughter can be a big girl and sit at the big table, hopefully she will then eat like a big girl!! It would mean my 2year old could sit at the table like an adult which he would love! My daughter loves sitting at the big table with us but often sits on her legs to add enough height for her to reach her plate. 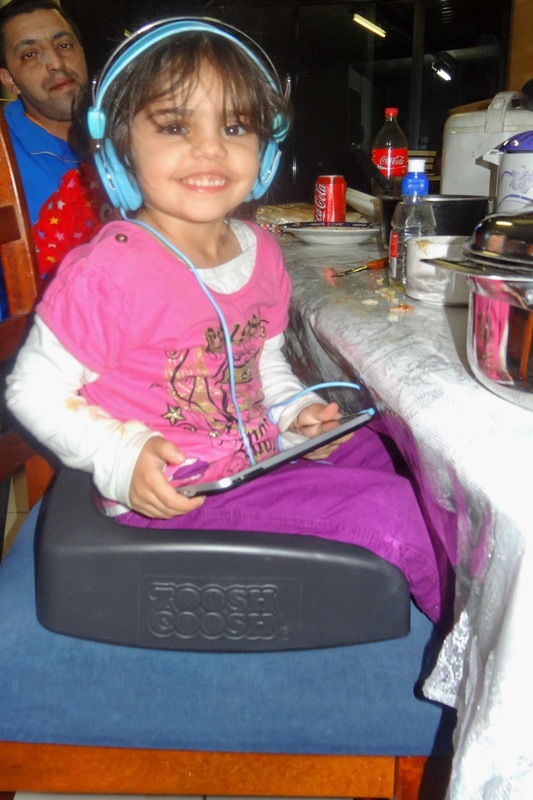 The Toosh Coosh would allow her to sit properly and eat her dinner without feet on the seats!